Do you know someone who loves chopsticks? Are you hosting an Asian themed party or event? How about a clever way to propose or express your love? 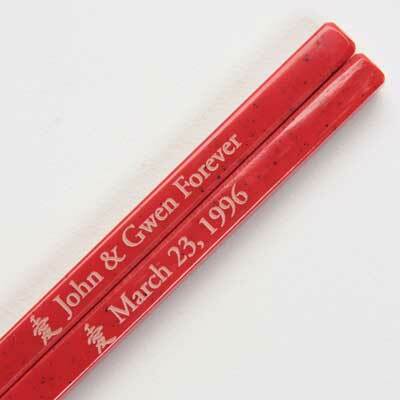 A fun and unique gift for all these occasions is engraved personalized chopsticks. With personalized chopsticksyou can present a delightful message on a pair of quality chopsticks. They make excellent party favors for birthday, wedding, anniversary and bar mitzvah events. Customized chopsticks are a memorable handout for corporate events and promotions. 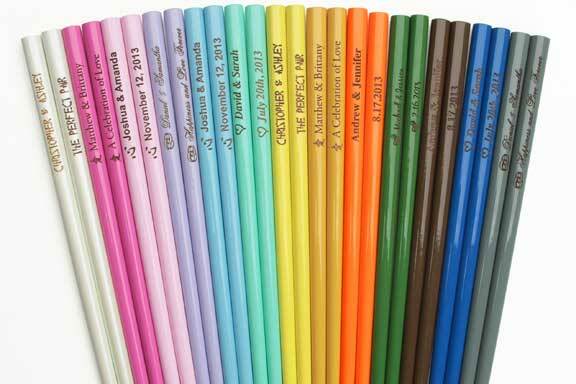 You can engrave virtually anything that will fit onto these customized chopsticks. Many people come up with fun phrases or puns such as "Jason and Ashley, the perfect pair!" or "Mike and Shannon, Two are better than one". Kanji with special meanings or graphics and company logos can be added. The most common chopsticks for personalizing are everyday wood chopsticks either in natural wood colors or painted with a variety of colors and finishes. At EverythingChopsticks.com you'll find the largest selection of colors for engraving including many of the popular colors for weddings such as hot pink, orange, brown, and gray. You'll also find chopsticks with flower designs, and more in a variety of colors. In addition to wood chopsticks you will find plastic chopsticks, especially heat resistant and dishwasher safe melamine chopsticks of the Chinese style available for engraving. These are excellent for when your event is culturally specific or if you desire personalized chopsticks for restaurants or other uses where durability is a factor. Unique to Everything Chopsticks is personalized metal chopsticks. These polished stainless steel chopsticks with grooved tips can be personalized like wood and plastic chopsticks. The personalizing appears black in a permanent bonding to the chopstick. 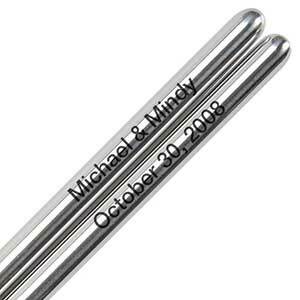 Personalized metal chopsticks have a classy, regal appearance not attainable with simpler wood or plastic chopsticks. Getting chopsticks personalized is easy. A wide variety of fonts and graphics are available, or you can provide your own graphic as well. Simple fill in the blank fields allow you to type your custom text just the way you want it to appear. Each stick within the pair can have its own message. Pricing is based on volume. You can engrave just one pair or hundreds. 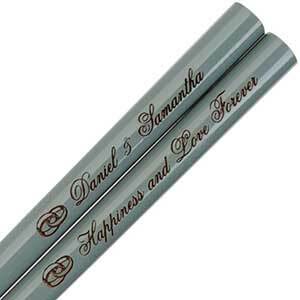 See the complete selection of engraved personalized chopsticks possibilities at EverythingChopsticks.com. Have fun!